Haitral model HT-CS141WPU is a hand sewing machine with adjustable 2-speed double thread electric crafting mending machine with foot pedal. This is a mini lightweight, compact and portable sewing machine that features double thread, double speed, no reverse button. It is ideal for little projects. It can also be used for teaching kids or beginners can also use it to learn how to sew. Being lightweight and a handheld sewing machine, it is not meant for heavy fabric like canvas or denim. It is mainly for light thin fabric. 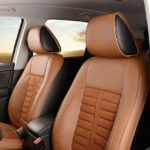 However, it is powerful enough to do minor alterations. It is also a sewing machine with light which is even handier on darker fabrics. It has two power supply modes; it can be powered from the mains or with 4 AA batteries. However, you cannot use both modes simultaneously. The battery power mode is very handy when traveling or in areas where it might difficult to get to the power supply. 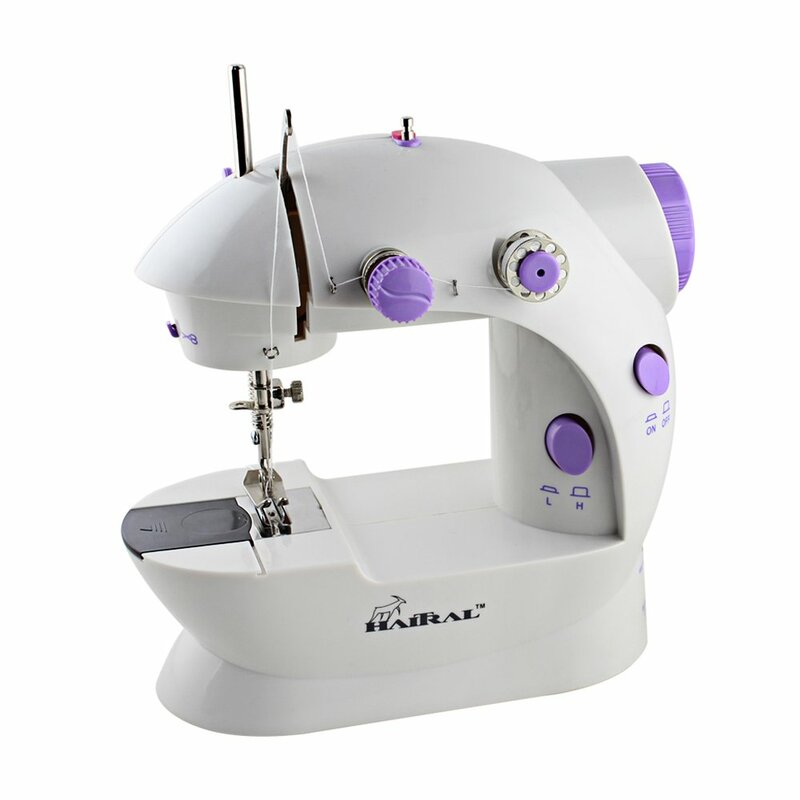 The package includes; 1x Handheld Sewing Machine, 1x Foot Pedal, 1x External Power Supply, 1x Manual, 4x Bobbins, 2x Needles, 1x Needle threader. It does not come with batteries, they are purchased separately. Portable and Convenient – the sewing machine is in a perfect size, fits in most large carry-on bag. It is lightweight that you can hang on your pegboard to continue your creative work anywhere anytime. Double Switch – this unique sewing machine has foot pedal and push button hand switch. It’s up to you which one you want. Double Speed For DIY Beginner – there are 2 speeds with l/h. The speed can be adjusted to ensure that any novice or even a master can work with on their projects in a hassle-free manner. Dual Power Operation – this product allows you power on by 4 of aa battery (not included in the package) when you somewhere without power plug or far away from a wall plug. Easy-To-See – the brightly lit sewing area is especially useful when sewing on the dark fabrics. This is another model of Haitral portable sewing machine used an electric crafting mending machine for minor alterations on clothes. It also has adjustable 2 Speeds with double thread and foot pedal. For convenience, especially when sewing dark fabric, it comes with light. The Hippih Portable Electric Sewing Machine has a lamp and thread cutter. It comes with 2 speeds, high and low. It is both battery operated and mains operated. The LIANTRAL mini-sized basic crafting mending machine is ideal to use when traveling for quick alterations and mini sewing projects. If you are on the go and from time to time you need a handheld sewing machine for clothes, this is it. Just for simple sewing and the like! This iBesi Mini Portable Sewing Machine is ideal for kids who want to learn how to sew. 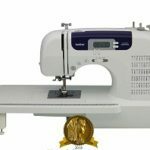 It is a mechanical sewing machine with 2-Speed, double thread and double speed. 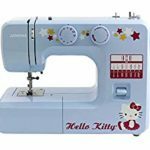 As a mini sewing machine for beginners it also comes with light for easy illumination and a cutter. This is a handheld sewing machine from NEX. 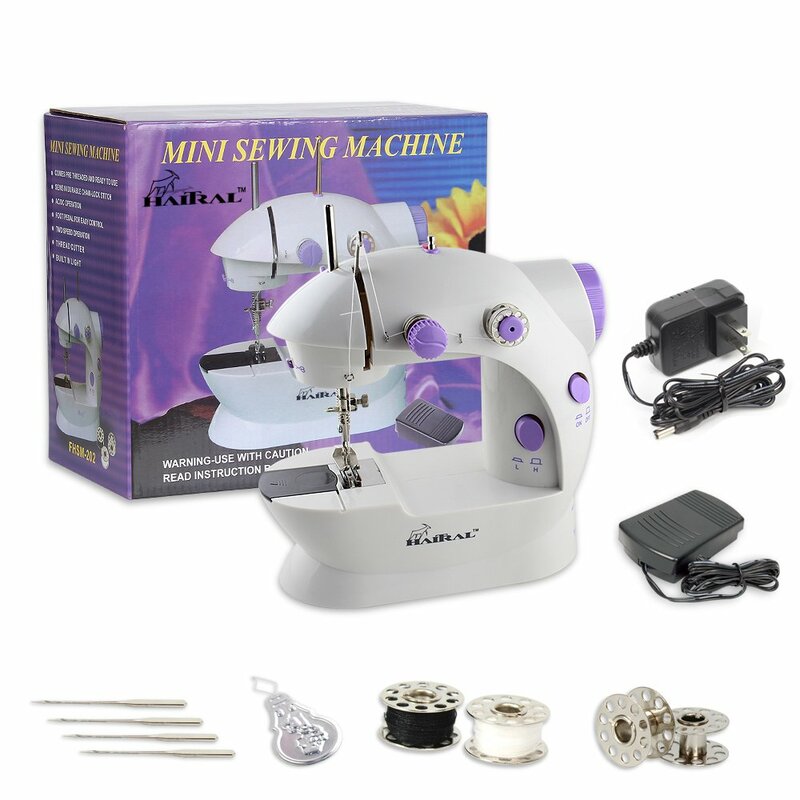 The NEX Portable Mini Electric Crafting Mending Machine has adjustable 2-Speed. It has double thread and it is a sewing machine with light. It comes with different color options including pink. Portable sewing machine for beginners. Adjustable stitch length and zigzag width allow you to customize stitches. 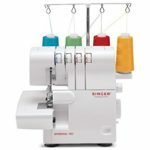 8 built-in stitches with 1 fully automatic 4-step buttonhole offer a variety of options for fashion sewing, crafts, home decorating and decorative sewing. Four snap-on presser feet expand your creative sewing possibilities.